In the examples below we use our domain if you want to test. Basically if you just add wp-login.php to the end of your domain you can then access the Default WordPress Login Page. WordPress also redirects any request to the wp-admin area to the default WordPress login page. So if enter this into your browser you will be redirected to the default login page. The core developers working on WordPress realized that these were not that intuitive so they added shortcut urls in later versions of WordPress which made it much easier to remember and user friendly. So in addition to the access urls mentioned above you can also access your login page with these shorter and easy to remember urls. Note: If you are using a WordPress security plugin that hides your WordPress Login url then these urls above may not apply. If you are using WordPress multisite then the url able will take you to the main site login page. To access subsite login pages see the example below. You may want to just bookmark the login page instead of having to continuously type it into the browser. To do that just visit your website’s login page in you favorite browsers and follow the steps below. Goto the page you want to bookmark. Change the Name if you want and Select the folder location. 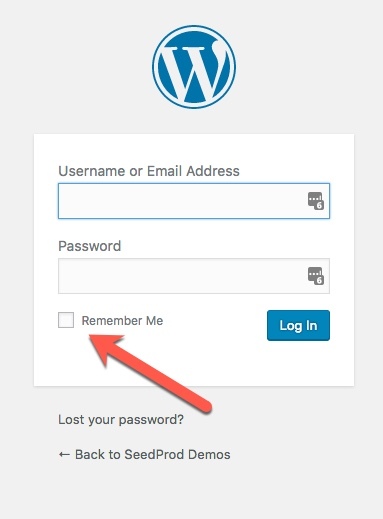 When logging into WordPress you also have the option to check the Remember Me box. Checking this will prevent you from having to re-login to the site for 48 hours or 2 days. 5 thoughts on "WordPress Login Page, The Easiest Way to Access and Remember"
Very helpful for WordPress users. It’s difficult to remember all passwords and data for your work. The URL’s list and browser bookmarking process are quite useful. Buenos días! !… Agradezco la información pero yo olvide mi contraseña necesito restablecerla, podrían ayudarme, gracias!! Im using my Android phone it’s not working… Help??? Not sure what you mean by you are being redirect here? Go to your website as described in the article to reset your password.